Home / Intro / HAPPY HALLOWEEN! We brought the treats… you bring the tricks. HAPPY HALLOWEEN! We brought the treats… you bring the tricks. Time to dress up, let loose and act out… Its Halloween! One of my favorite holidays for many reasons. It’s also a big promotion and event at many bars, clubs and venues across the nation. All sorts of characters come out to celebrate with lively libations and devilish delights. The night is full of surprises and disguises. Wow I sound like Chico Garcia there for a moment… anyway’s bottom line its a fun event and hopefully you prepared well in advance for it. Stocked your bar, ran promotions and already have your costume ready. What will be the hot costume this year??? Who knows… but we would love to see how creative our bartenders are? Email us a picture of your costume from behind the bar on Halloween and we will post our favorites in the next issue of Flairbar.com. So be creative and have fun. 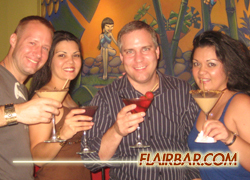 You can email us at rob@flairbar.com. In honor of Halloween we have a treat for you.. One of the most eye opening Flair bartending competitions this year… Nations 2008. With a star studded cast of competitors from across the globe, this event changed our level of understanding on difficulty in the Flair world. One man raised the bar to a new level and got many people thinking. See the full review “The World of Flair Changed Today!” by James Sordahl. With videos and more on our ‘Comp Reviews’ page. What can you do to push the bar higher next time? Nations 2008 was an incredible competition and it took an incredible competitor to win it… On the cover of this months issue of Flairbar.com we have Tomek Malek all the way from Poland who just recently won Nations 2008. Check out “Polish Pride”featuring Tomek Malek all on our ‘Interviews’ page. Expect to see more things from Team Poland in the future. On your way to raising the bar to the next level, you can start with Paul Trzcianko as he teaches us a 2 bottle and tin exhibition Flair sequence on our ‘Masterclass’ page! “The Mad Russian” and “Team 437″ do it again! “Team 437″… what you haven’t heard about them? Get to know more about them, how the team got started and the meaning of their name all in “The Story Behind Team 437″ by Dan Seitz on our ‘Articles’ page. Stop by and say hello when you are at Quest this year. Anthony Alba is “In the Mix” again with “Spinning the Classics”. Find out his take on the new twist on classic cocktails emerging in our industry. Inspired to be creative… I love it! Then we head over to Paris, France with Laurent Greco from Bar Academy Paris as he shares with us his “Angostura Adventures” on our ‘Flavors’ page. You know… Angostura… that bottle most common bartenders in America don’t use. Come on people… time to step it up! 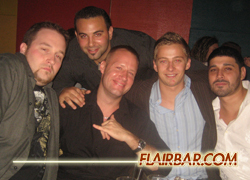 Kevin Bednarz is back again with one of our newest additions, “Flairmation” which we revisit “Last Call Larry” dealing with proper bar conversation. All on our “Flairmation” page. Larry… Larry… Larry! We are pleased to announce that the “Glossary” is back! It took some work but we blew off the dust and changed the batteries and it is up and running at full power. 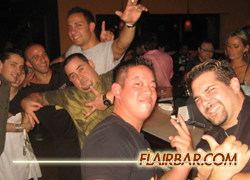 Be sure to keep an eye on it as we will continue to keep adding to this on going database of Flair bartending knowledge. When your done with that then head on over to on our ‘And Finally’ page and “Make Your Next Night X-Rated!” featuring what else… X-Rated Fusion Liqueur. How will you make your next night X-Rated? Next we have the results of our ‘Reader Contest’ for our loyal Flairbar.com readers with our “Finest Call Caption Contest”. See the winning caption and have fun and submit one of your own. Plus our regular features, more ‘Barware’, more pages, and more Flair than you can shake a five bottle juggle at. 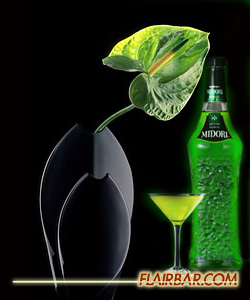 So take some time out and enjoy a cocktail with SKYY Vodka, Finest Call, Midori or X-Rated Fusion Liqueur as you enjoy this months issue of Flairbar.com and say “Thank You” to the sponsors who keep our sport alive.